A piece of Swedish prog history is made when this Malmö based instrumental quintet makes their first live appearance in 35 years and reunites to perform songs from their (so far) only album “Blå Vardag” (1979) that is considered a true gem by many vinyl collectors. It’s a highlight of PC16! Their instrumental and light hearted and melodic symphonic folk/fusion/jazz à la Camel, Genesis and Kaipa (of the 70’s) deserves to reach a wider audience. We hope to help with that by hosting the first ATLAS gig in over 35 years on PC16! 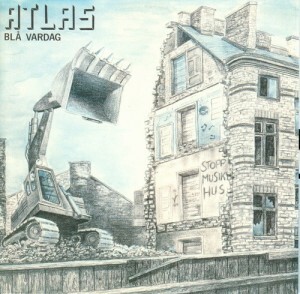 After their break-up in 1980 ATLAS took a short pause from activity until 1995 when they recorded ”Hemifrån” – a bonus track for the CD release of ”Blå Vardag”. Then another short pause for 20 years, and today the members have waited long enough to once more present their old tunes on stage. Björn Ekbom and Erik Björn Nielsen provide a main component of ATLAS’ material, with vintage sounds of pianos, organs, mini-Moogs, clavinets, Rhodes’ and mellotrons, interplaying with Janne Perssons guitar, and backed by Ulf Hedlund on bass and Michael Pinotti on drums.